This page is inspired by Eric S. Raymond's SF glossary page. I try to define computer gaming terms in a manner which people unfamiliar with them understand, but I also try to be concise and complete in the definitions. I don't know if I can call this an authoritative document; I'm not sure I want it to be. In addition, I'm not too confident in my ability to define terms; I'll admit I'm scared of ill-defining them or setting them in stone. If you find anything that's poorly defined, missing, or simply wrong, please let me know. I hope, with the help of others, to make this a good reference. Often used in turn-based strategy games, action points are points consumed when your units perform actions (such as moving, reloading, or exchanging inventory). More complex actions require more action points. In FPSs, bunny jumping refers to the act of jumping, landing, and immediately jumping again, often while strafing, to gain extra speed. Refers to the act of randomly and frantically hitting buttons in the hopes of winning. Often used by inexperienced players of fighting games. Deliberately not moving around the map to find opponents, instead waiting (camping) in one spot for unfortunates to run by. Short for combination. Often used in fighting games to chain up moves that would otherwise be inaccessible to the character. For instance, if a kick is immediately followed by a punch, the resulting punch is different from (and often more powerful than) a punch thrown without the preceding kick. First Person Shooter. The view is from the eyes of the character you play, and as the name implies, there are often numerous enemies that you shoot down. 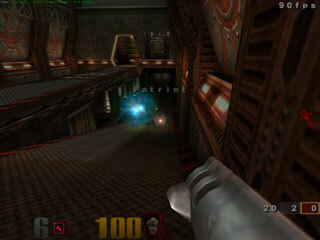 Quake III is a typical all-out action FPS. Another meaning of FPS is Frames Per Second, which, while it isn't exclusively related to gaming, is fairly important in an FPS game. A frag is a point you get when you kill an opponent. It's almost the same as a kill, except that you will normally lose a frag (point) if you accidentally kill yourself or a team mate. Ganking means stealing something from someone else, usually when they're not by their computer playing. A soldier gibs after being hit by a grenade. From Half-Life. In RPGs, grinding is the act of repeating an action (such as killing monsters) over and over again to accumulate gains. Short for micro management. In RTSs, it's the ability to manage your economy, battles, and miscellaneous tasks (such as researching technology and fixing buildings and units) simultaneously. For instance, if you manage your battles well but forget to tech, and your opponent manages both these things well, your next battle with him will most likely result in a loss. Variously spelt newb, noob, or n00b, a newbie is a person new to a game. In cooperative multi-player gaming, newbies can cause harm to a team (such as accidentally shooting a team mate), and are therefore sometimes scolded by the more experienced players. Non-Player Character. Any character in a game that is not controlled by a player. 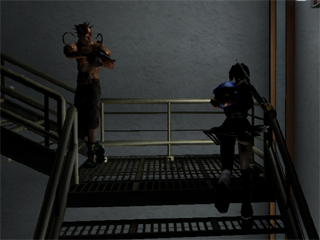 An NPC (left) engages the player in BloodRayne 2. In RPGs, a party is a group of characters (NPCs or other human players) who assist the player for the duration of the game. 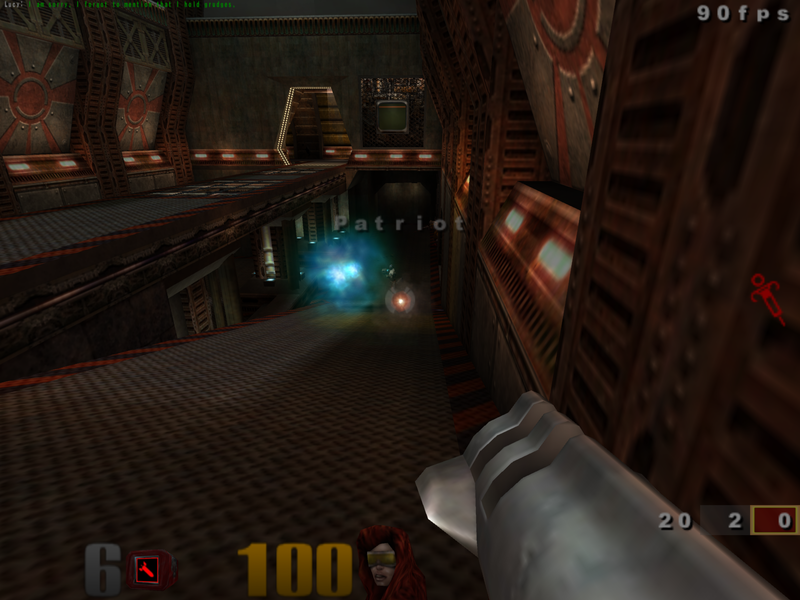 Some games include the ability for the player to add and remove party members at will. In MMORPGs, parties are usually informal groups of people working together for a simple goal (such as slaying a tough monster or completing a quest). The more permanent method of grouping in MMORPGs is usually called a guild. Pronounced powned. A deliberate misspelling of ‘own’. A player is pwned if he is beaten easily by his opponent. Often used as an exclamation by the victor, as in “Pwnd!” See gank. Often used in RPGs, a quest is a task that the player(s) must (or want to) accomplish. Respawning is what happens when an item or a character has been taken out of play and is re-inserted. See spawn killing. 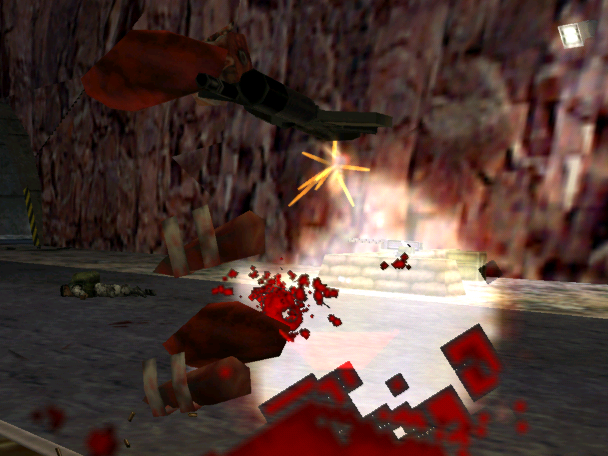 In FPSs, a rocket jump is a jump assisted by a rocket for the purposes of reaching greater heights. Real Time Strategy game. You are usually a commander of some sort, and the view is often top-down. Your missions usually involve crushing the enemy forces by military means (building an army and ruining the enemies' base(s)), but can also be based around destroying certain buildings, retrieving an artifact, or reaching a particular point in the tech tree. A typical RTS will have worker units to build buildings and gather resources (gold, gas, wood, minerals, stone, etc. ), and troops to fight the battles. An RTS player's skill is usually measured by his micro. In RTSs, rushing is a strategy used to overwhelm your opponent early in a game. Examples of rushing are military rushing (where you train military units as fast as possible and send them to the enemy's base) and tech rushing (where you research technology as fast as possible to get access to heavy-duty units). Spawn killing is the act of waiting for another player to respawn at a spawn point and then killing him. Not only will the spawn killer have the element of surprise, he will also most likely be better equipped (having better armor and stronger weapons). Clearing a game as fast as possible, normally one not intended for beating the clock (for this reason, racing games aren't said to be speedrun). Speedrunners try to find the fastest route through the game (bunny jumping for speed and rocket jumping for reaching otherwise-unreachable areas are normal strategies), often by exploiting glitches in the game (such as walking on the top of the level thereby skipping significant portions of the map). Speedruns may be unassisted or tool-assisted. Unassisted speedruns make use of only what the game contains and played under standard conditions (on an original console, or with an emulator with no extra tools). In tool-assisted speedruns, almost everything goes. This includes using an emulator to slow down time and making extensive use of the save and load states (saving a game often and loading when something goes wrong). Additionally, unassisted speedruns may be single-segmented or multi-segmented (played all at once or played level-by-level and then stitched together). In FPSs, side-stepping. A useful technique for keeping your aim at an opponent while keeping yourself on course. Short for technology tree. In RTSs and turn-based strategy games, a tech tree is the possible research path a player can take. The tech tree for Civilization IV. Teching is advancing up the tech tree. Similar to RTS, except each player can take as much time as he needs to issue orders to his units. Control is given to the next player if the current player skips his turn, or runs out of action points. In RTSs, turtling is the strategy of going defensive early in a game, often as a counter against military rushing. In RPGs and MMORPGs, a wipe happens when an entire party is killed. It can also refer to what happens when the accounts of any entire party in an MMORPG is deleted.